And even though it takes a while to cook (about 90 minutes), it is well worth the wait! 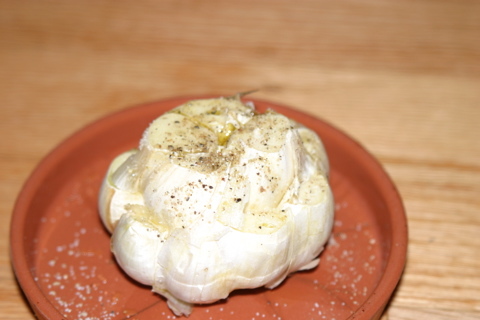 To get started, cut off the first 1/2 inch of the top the garlic bulb, so that it will be easy to spoon off the garlic later on (see picture above). Put in a pan, drizzle with the olive oil, add salt and pepper and cover. If you have one of these special terra cotta garlic baker, use it, otherwise, you can use a pyrex pan, and use aluminum foil to cover it for the first 45 minutes. Variation: you can add a teaspoon of white wine at the same time you put the olive oil. This is ideal as the base for many recipes. Or as an apetizer with the right spoon, or as a spread if you puree it.